Which Saw Should You Use for Your Next Project? A circular saw can be one of the most useful tools that you keep in your workshop. The best circular saws have enough power to cut through dense material while still being easy to handle. In addition to that, you have a diverse range of options when it comes to purchasing a circular saw. There are the lighter weight circular trim saws, or steel cutting circular saws, and even models that can be used to cut concrete. Having a variety of different designs and styles to choose from is good, but it can make it difficult to find the right model for the individual. There is more to finding the best circular saw than looking just spending a lot of money. You need to understand your options and find a model that is well suited to the work you do. To help you decide, break the choices down by design, corded or cordless functionality, and additional features like blade size and bevel capacity. Circular saws can be divided into two basic design styles: the sidewinder or inline design and the worm drive models. The sidewinder design is what most people would recognize as the traditional circular saw design. The motor is next to the blade and the saw operates on a direct drive system with a shaft that goes directly from the motor to the blade. On these models, the handle is usually set high over the blade and the blade is usually positioned on the right side of the unit. With worm drive models, the motor is usually situated slightly to the back and at a right angle from the blade. Instead of the direct drive of a sidewinder, the worm drive system uses gears to increase the torque. A circular saw that operates on a worm drive is going to have a slightly longer body, and instead of having a handle that is angled toward the top, the handle is usually directly behind the blade. As an additional difference, the blades on these models are commonly positioned to the left side, and that does make it easier to sight for right-handed users. You can also choose between cordless circular saws and models that need to be plugged in. In the past, you had to make a significant sacrifice in power to go cordless, but as the power packs have gotten bigger, you can now find cordless saws that offer good power. 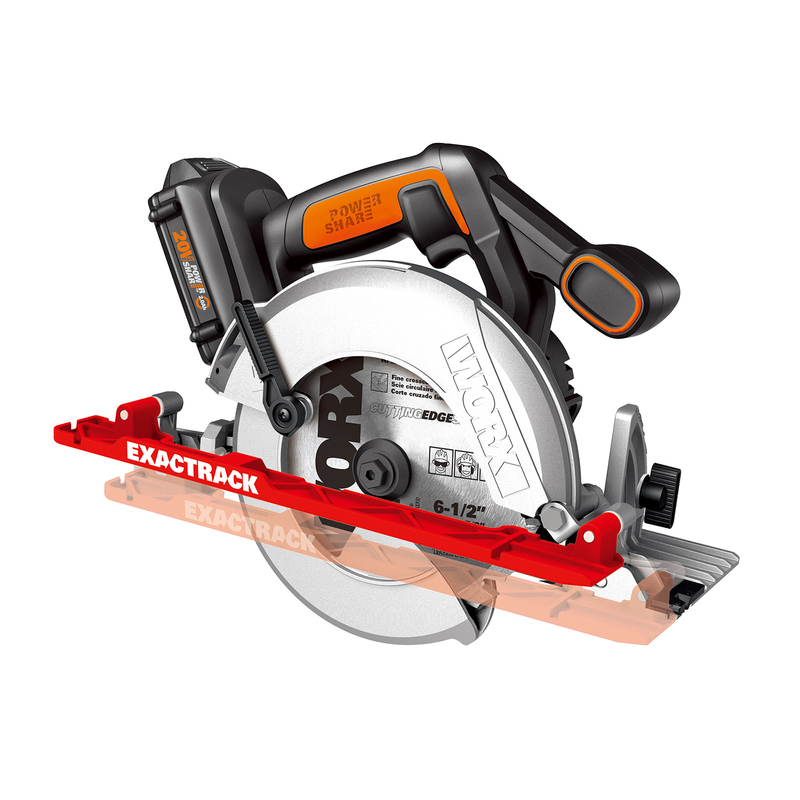 A good example of this is the Worx ExacTrak 20v circular saw. The innovative, ergonomic design makes straight cutting easier than ever thanks to a cutting guide board. Meanwhile, it packs a powerful punch with its 6-½” circular saw blade. You can still get more power if you go with one of the heavier corded models, but for most people, a cordless power saw should be able to get the job done. If you are trying to decide between cordless or corded, the main point to consider is where and how you use the saw. If you use it in places where there may not be electricity, then a cordless model can be good. However, if you have a lot of cutting to do and electricity is not a problem, a model that has a cord is probably the better option. When purchasing a circular saw, you should also look into a variety of different features and specifications. This would include things like the blade size, the shoe design, bevel capacity, and the hardware for making adjustments and changing blades. It is these blades that can transform your wood cutting circular saw into a steel cutting circular saw. Blade size is a particularly important feature because it will determine the maximum depth of the cut. You can go with models that use blades of 7-inches or larger if you need to make deeper cuts, but if you need a circular trim saw, you would look for a model with a much smaller blade. You also have smaller models like the Rockwell 4 ½-inch Compact Circular Saw. The 4 ½-inch blade might not cut as deep, but the saw is smaller and easier to handle. Beyond checking things like the blade size and the bevel capacity, you are also going to want to take a look at the knobs and levers to see how durable they are and to see how easy it is to make adjustments. Additionally, you may want to consider any special features. Some brands might have a specially-design shoe that is supposed to make it easier to guide your cuts. You may even see some that have laser guides. Which Saw Should You Use for Your Project? Break the choices down by design, corded or cordless functionality, and additional features like blade size and bevel capacity.